Tuesday, February 19, 2019 from 11:30 a.m. to 2:00 p.m. 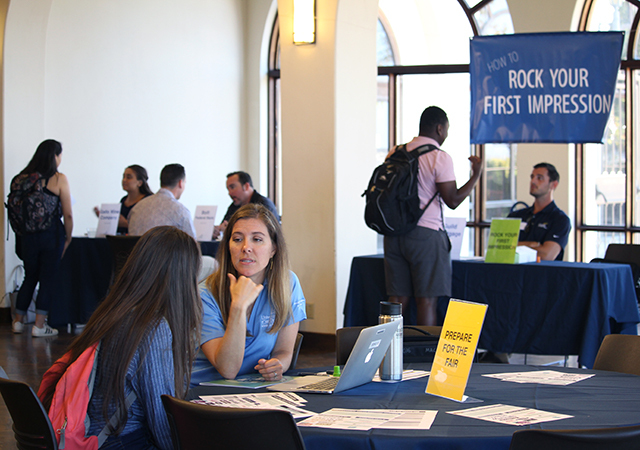 This is a great event to prepare for networking events like the Career Fairs, Torero Treks, and more. CDEV will have various stations to help you practice your skills and build your strengths for your career journey. Visit some or all of the stations - whichever works best for your needs! Get a professional LinkedIn headshot, have your resume reviewed by recruiters, practice your "elevator pitch" with professionals, learn how to navigate big events like the Career Fair, get tips on how to maximize Handshake, and more. There was a problem retrieving the post. Please visit Facebook to view this post. Read More.